I am in love with these sweet little things. They are the most simple craft I’ve ever made and cost next to nothing (I think a sheet of felt at Michael’s is about 30 cents), but the finished product has such a big impact. So easy, even little kids and cavemen can do it. They fit in the palm of my hand. Is that a better illustration? This is just to give you an idea of how to cut your felt… you don’t have to literally draw a swirly circle pattern thing on each square. Oh yeah, now cut the felt. 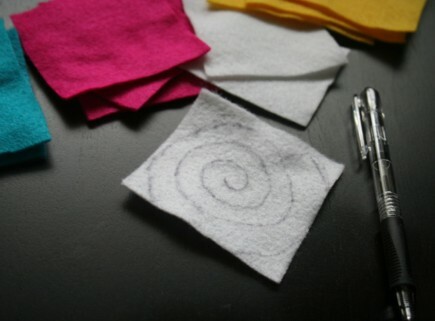 After you cut out the swirly circle pattern thing, take the outside end of your felt circle (it’ll make sense once you’re there) and start rolling it up toward the center. You’re going to do this sort of like how you roll a sleeping bag. If you have never rolled a sleeping bag, you’re just out of luck because I can’t come up with anything better to describe this process. Also, you’re missing out on some joyous times because camping is fun. I’m sorry. 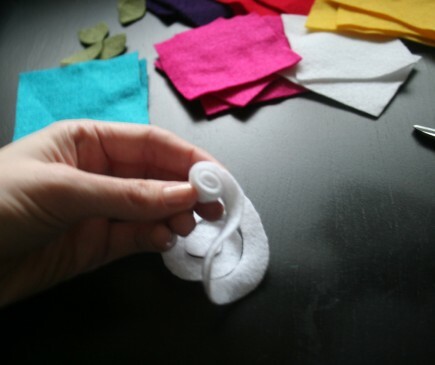 Once you’re finished rolling the felt, dab a little glue to the remaining end and secure it to the bottom of the rosette. This step makes me happy each time I do it because the end of the felt fits perfectly at the bottom of the rosette. Again, you’ll see what I’m talking about when you get there. It’s magical and my OCD appreciates this. 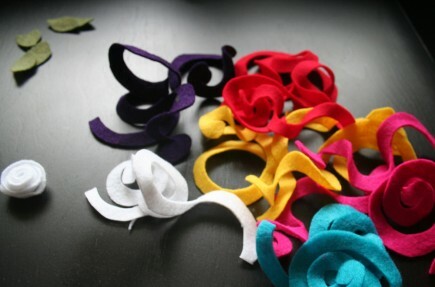 Some more swirly scrappy circle things ready to be rolled like a sleeping bag and magically glued into rosettes. Man, I need to start writing poetry. These things just come to me. CUTE of course. Obvioussslyyyy. Uh I had something more exciting to say and I totally forgot :( fail. OH YEAH! Rolling sleeping bags is the worst. Especially the kind that you had to fit back into a SMALL BAG! So mean. Ps, Justin make my blog awesome? your cute craftiness freaks me out sometimes, it’s like whoa. seriously, i’m freaking SURROUNDED by you amazing people! i obviously need to get with the program. also? i’m charmed by your wit. and impressed with this posts photography! 1) your new blog look is FANtastic and lovely and just perfect for you. Major props to Justin… I am quite impressed!! I love it!! 3) I am SO so glad you posted this, because I just bought a ton of felt to make a birthday banner for Rosalie and I have so much left over. Now I know what I shall do with it, because these are the cutest ever. I LOVE this little craft. Definitely pulling out my change collection and running to Michael’s! Thanks! Miss Blur: You can find them for pretty cheap at Sally’s! That’s usually where I get mine… we have like 15 of those stores here in town, haha. Heather: That dress is flipping adorable! I think I need a nap. And some rosettes. These are to die for! I’m going to have to make some now :) Thanks for the great tutorial! 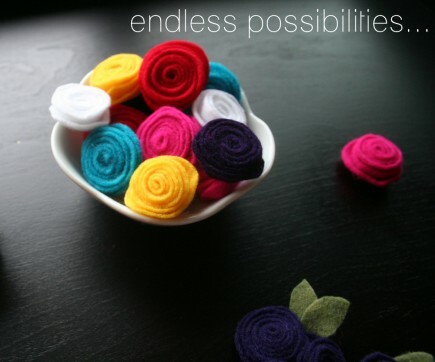 Thanks for the tutorial… I can see many of these in my future… super cute and simple! That is the kind of craft I LOVE! These are just adorable! I always am on the lookout for something cute and easy to ‘gussy up’ for the this and that I make for my grandaughter. This is perfect! And looks so easy and fun to make! Thanks for sharing! Those are really fun. I keep picturing them on my little baby girl’s sweater! Or a head band! The possibilities are endless! Thanks for sharing your great ideas! Love your blog, and your fabulous prissyness! PS. I love vintage hankies! At our wedding we hand oodles of vintage hankies so that each female guest could take home their own hankie- and use it for the tears of joy during our ceremony, natch. These looked so cute and easy that I had to get started right away! LOVE IT! So cute and easy to make. Now I have to get a bunch of felt ASAP! 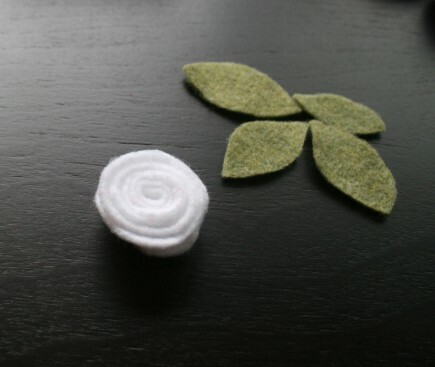 Oh I meant to say this in the other comment post: other ideas for the felt rosettes can be pins/brooches, pen toppers (glue on top of a pen), and headbands. I’m definitely trying all of the above! Toooooo cute. I’ve seen this done in paper, but felt is great!. Thanks for sharing. I love them! They’ll go perfectly with my new obsession of crafting hair accessories. I *love* the little barrette, but I’m SO not all about DIY – guess you’ll have to open an Etsy shop! Eeek! These are so precious! Love em! And you! super cute!! i’ve been crafting with felt like a madwoman lately – making poppy flower hair clips & decor for my little one’s upcoming first birthday party. 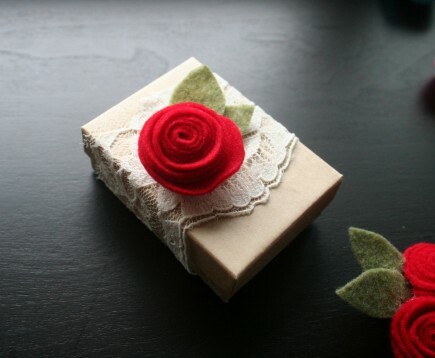 these little roses are so cute! thanks for the tip! love it! These are so fantastic!! Love them. 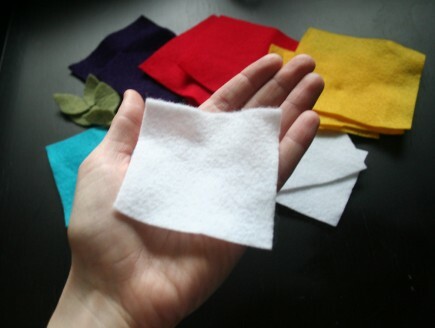 i love this tutorial and your precise instructions =) i have so much excess craft felt lying around (bought the wrong kind a long time ago to try my hand at other felt crafts that required wool felt) and now i know what to do with it! Goodness, I think I died and went to heaven when I found your blog. Not only am I an Etsy addict, but I have a major thing for flowers and tutorials. And here they are…all wrapped into one. I just found your blog today and you are delightful. I can’t wait to try making the rosettes. i just randomly came across your blog and i love it! so crafty and random. anyway, i was completely inspired to make my own little rosettes. i have no clue what i’m going to do with them yet… but i’ll figure that out later. even i could make these darling flowers! thanks! this is a fabulous idea! these are sooooo purdy!!! Thanx for the share! Thank you for sharing such a great tutorial. I enjoyed it very much. SO cute – I'm planning on making some today… thank you very much for sharing! Wow these are so cute! I will have to make some for my daughters and nieces. I love your pretty felted flowers. I’ve wanted to try this for awhile and appreciate the clear and simple tutorial you provided. I’ve heard of people using old sweaters to make felted flowers too so I will have to put this on my to-do list. TFS! I love this! The instructions are easy, and your comments are absolutely hilarious! Thanks for posting this! I am SO excited to make some this week for a fall craft!!! I really appreciate you passing on your mad skills! Love it! 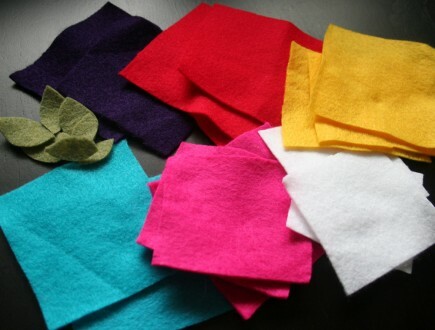 i am OBSESSED with felt right now! Will bookmark and make sometime! Totally cute will feature these on my blog http:kraftstreet.blogspot.com Check it out its called 24 Kraft Street! Perfect tutorial. Just what I was looking for! How do the centres stay intact? Do they not pop up after some time? Do you ever add more glue along the way than just at the end? Your instructions were hilarious. Your explanation is very much my style. Love it. I can’t wait to make these! Those are so pretty, and not as complicated as I would have guessed. I’m including them in my Friday Favorites tomorrow! thanks so much for the tutorial, it was helpful for our craft night. I love really like your other tutorials and might have to give them a try in the near future. 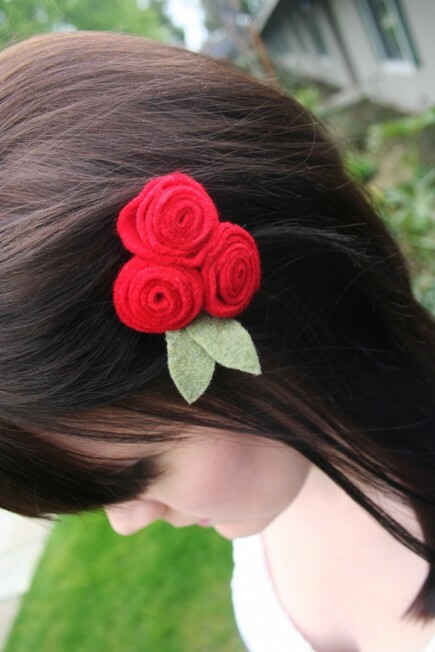 Great tutorial–I’ll definitely be adding more rosettes to my fascinators and hair clips from now on! I usually use a roll and sew method, but these seem so much easier. I loved you tutorial! I appreciate all the great photos! Oh my gosh, so easy! Thank you for posting this. 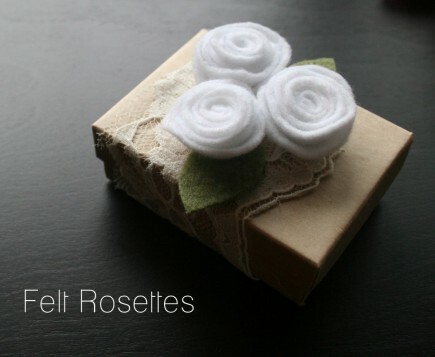 I googled how to make felt rosettes, and found your blog. Super cute, thanks again! check out what i did with your tutorial. go to my blog.. dantaesmom.blogspot.com. thanks again! also, if you start rolling the felt starting with the inside end it makes a slightly different shape, though you dont have that awesome little piece to cover the bottom. also, if, rather than smooth cuts, the cuts were wavy or some other pattern, it would give the flower a completely different look. We totally made some of these too! Thanks! I would make these with my grandmother when I was little. so easy and sweet. Very nice ! Thank you for the explication. btw, when shoe clips are attached, isnt it uncomfortable when they touch the feet? What a great and easy way to make such elegant and beautiful flowers! Thank you for sharing! This is so easy and adorable. I am a preschool teacher and I have 11 little princesses in my class…I am going to make these for Christmas!!! !